Morgan Alliss eats lunch at Lafayette's Shadeland Mobile Home Park, one of the 11 sites participating in the pilot. It’s lunchtime at the Romney Meadows affordable housing complex. This is Food Finders Food Bank’s biggest open feeding site, averaging 40 children a day. More than half of the students at the nearest elementary school, Mayflower Mill, are eligible to receive free or reduced price lunches through the National School Lunch Program during the school year. In the summer, Craft says, that support system goes away, replaced by the Summer Food Service Program. But sometimes attracting kids to the feeding sites can be tricky, whether the issue is a lack of transportation, the distance to a site in more rural areas, or even a lack of awareness that the program exists. The pilot Craft’s running, in development since 2015, has a simple premise: treat someone’s home as a feeding site. Program participants undergo background checks, and are trained to properly complete the paperwork showing meals served and track food temperatures. There are also monitoring visits before and throughout the program. Part of the hosts’ responsibility is reporting back on what works--and what doesn’t. Craft says the pilot’s success is measured by how many families sign up, if they’re able to commit to and comply with the entire program, and if they wouldn’t have accessed the traditional summer feeding program. As the first week progresses, children and parents are already waiting at the front door when the Food Finders Mazda pulls up, poised to trade paperwork for the brown lunch sacks cradled in Share Our Strength intern Matthieu Jarrett’s arms. All of the families participate in the free and reduced price lunch program during the school year, and most receive SNAP benefits. But many say they’ve never participated in a summer feeding program before now. Matthieu Jarrett prepares to deliver milk. “To me, it seems like an issue of comfort,” says Food Finders CEO Katy Bunder. Bunder says families have different needs--so the traditional format of seeking out a congregate feeding site, of children walking to a park to eat together, might not serve as many people as it could. “The children who are going to be eating in these homes as sites through the Share our Strength program would not have gone to the congregate feeding sites that Food Finders runs in Tippecanoe County,” Bunder says. The pilot has been a learning process. On the first day of the program, no one was home at the day’s first stop. The initial goal was 30 participating families, but only 11 are participating. The Tippecanoe County Health Department had worries about whether families would handle food safely. A spokesperson says the department initially thought the home sites would be open to the public in the same sense as congregate feeding sites--issues health department and Food Finders officials say were discussed and resolved. According to a report from the Food Research and Action Center, Indiana’s existing Summer Food Service Program actually saw a 16 percent increase in participation in 2017, one of three states to see an increase of better than 10 percent. Indiana served more than 1.8 million lunches last summer at almost 1400 sites. The Departments of Education in California, Vermont, and Colorado are fully or partially reimbursing the sponsor organizations for the pilots, but Indiana’s is not. Indiana DOE spokesman Adam Baker claims that’s because Share Our Strength didn’t communicate with state officials in time. 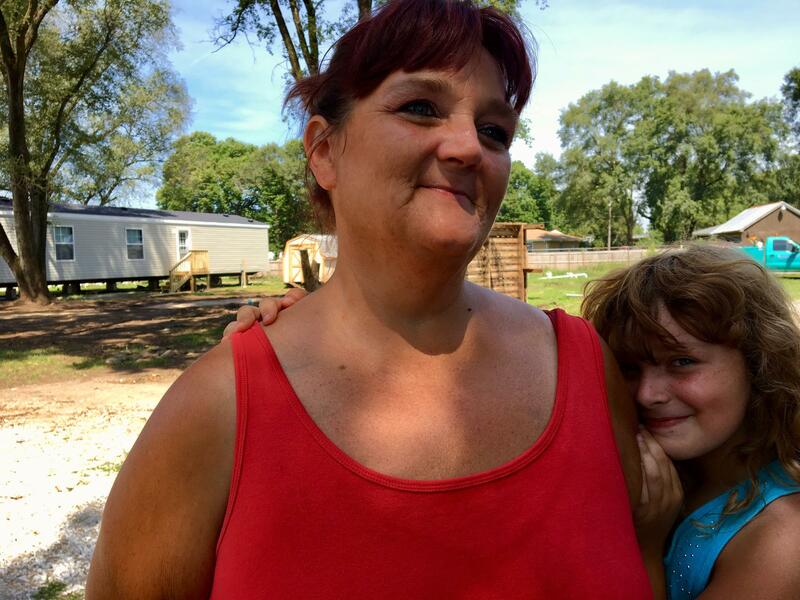 At Shadeland Mobile Home Park in Lafayette, Yvonne Cornell is preparing to feed seven children lunch—her own, and kids from across the neighborhood. “I call it the safe haven area because they all feel safe here and they play and they can get crazy and wild, and if they want to talk, they talk to me about whatever is bothering them,” Cornell says. She feels more comfortable keeping kids at home to eat. There are two kittens — Tiger and Nightmare — asleep beneath a wooden table, a garden and pet rabbits out back, and bikes parked in the front yard. Cornell’s daughter Elizabeth snuggles under her mom’s arm. Cornell says children often ask her for something to eat, so she tries to stretch the food she has on hand. Yvonne Cornell and her daughter, Elizabeth. “If we don't have enough to share, we always find something to share, don't we?” Cornell says to Elizabeth. “And every once in a while, we have to go to the food place,” Elizabeth says. “We do go to the food pantry sometimes, don't we?” Cornell says. When Cornell learned about the pilot, she saw it as a simple way to solve the problem of feeding hungry kids at home for the summer. Cornell starts handing out lunch. The kids fill both benches of a picnic table in the front yard, unwrapping cheese sticks and comparing apples and bananas. 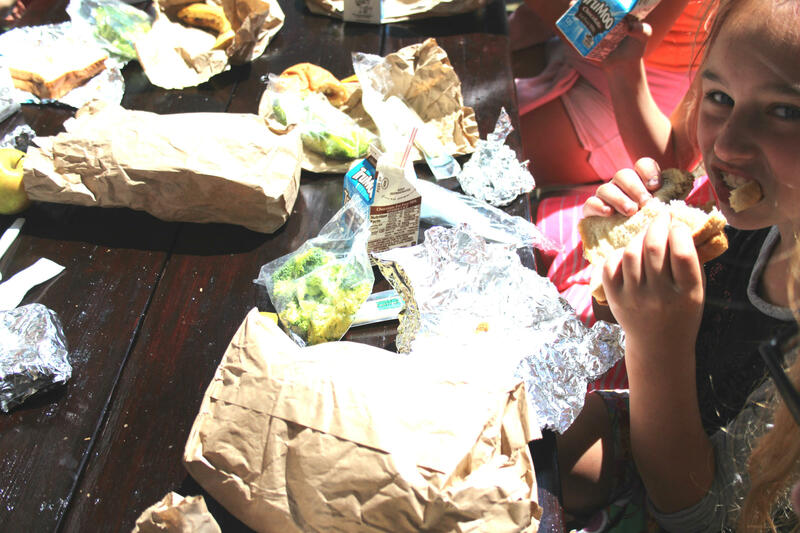 In 2017, Food Finders served almost 20,000 lunches to an average of more than 300 children per day through the traditional summer feeding program. The pilot program will serve about 1,100 meals to a little over four dozen children—but it’s a pilot, and whether the program continues next summer, the children at the picnic table are being fed today.